Hola! 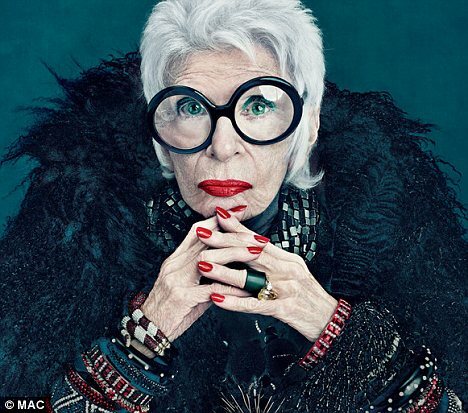 Can you believe that the fab and always fashionable Iris Apfel is 90? 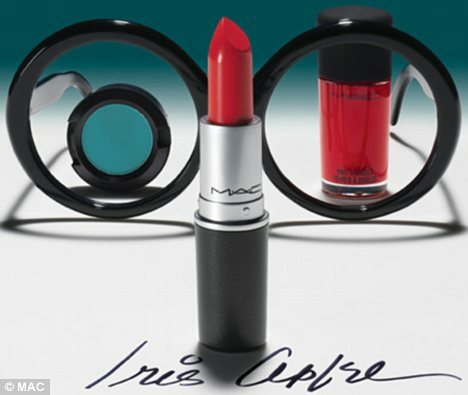 Age is definitely just a number for her as she recently teamed up with MAC cosmetics to launch makeup that reaches the masses of every age group. In the past MAC has collaborated with Lil Kim, Mary J. Blige and Nicki Minaj to name a few; however it is good that they aren’t ageists in any way and relating to all of their customers. Items for your lips, eyes and nails are named after birds and range from $14 to $23. I am loving that fierce red lip that she is rocking. All sounds good to me, will you be checking out the line on January 5th? For more deets check the source here. Enjoy! i love those glasses. I bought Arianna some fake rayban type eyewear. I can’t wait for her to see them! I do too! Of course hers are Chanel…to rich for my blood! Lol. Awe sweet she is going to love them!